The mouth and tongue are lined with a special type of skin called mucosa; it appears mostly pink because it is thinner than your normal skin. Sometimes a change in its appearance is normal, and other times it can be an indication of illness or injury. White patches in mouth is a thick area in the lining of the mouth (mucosa) that can develop on the floor or roof of the mouth, inside of the cheek, lips, tongue, or gums. Canker sores are painful white ulcers in the mouth surrounded by an area of redness. They appear most often on the inside the cheeks, inside the lips, and your tongue. Canker sores are different from cold sores, which are caused by the contagious herpes virus, and canker sores are not contagious. Canker sores may recur, and can be small (minor), large (major), or multiple, in groups or clusters. Although the exact cause is unknown, some experts believe that an impaired immune system, viruses, or bacteria may be involved. Other factors such as stress, allergies, trauma, iron or other vitamin deficiencies, heredity, and cigarette smoking might also put people at risk. Thrush is a mouth infection caused by an overgrowth of the Candida fungus that normally lives in many people's mouths. Early symptoms could be a bad taste in the mouth and decreased taste sensory. 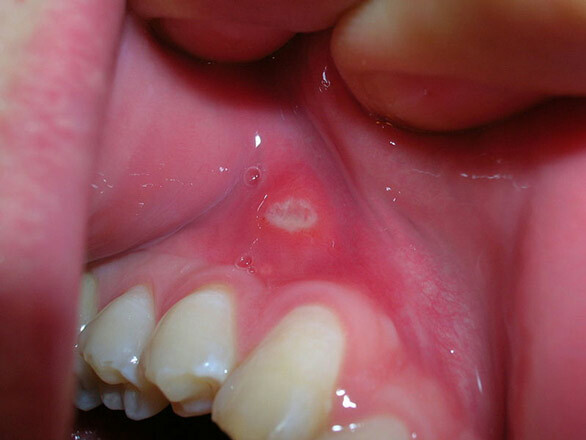 Thrush causes curd-like white patches in mouth, including the roof of the mouth and/or back of the throat, the corners of the mouth, and especially on the tongue. Thrush is most common among those debilitated by disease, denture wearers, newborns, and people with immune disorders. Other people who have a dry mouth, or who are taking or have just completed antibiotic treatment, are also at risk for developing thrush. Leukoplakiais a white patch that develops on the inside of the cheek, the tongue, or on the roof or floor of the mouth. It is mostly caused by chronic irritation of the mucous membranes in the mouth, and typically goes away on its own. Tobacco use, including smoking and chewing tobacco, where they hold it against their cheek, can cause leukoplakia, but other irritants can cause this condition as well. Hairy leukoplakia is a type of leukoplakia that can affect people whose immune systems are compromised by disease or medications. Hairy leukoplakia will cause fuzzy, white patches on your tongue, and it's often mistaken for oral thrush. It is common and quite normal for people to have a white line along the inside of their cheeks, where their teeth rub against the cheek. A burn in the mouth from hot drinks or food can produce white blisters that normally peel off soon afterwards. If you have been suffering from an illness and haven't moved your tongue around much, you may get a furry white tongue. You can usually gently rub or scrape this off using a toothbrush. Mouth ulcers are white because of thick layers of skin cells that form over the ulcer during the healing process. Damage to the mucosa caused by a rough tooth or the irregular surface of a denture or a filling. Dentists and doctors are most concerned about the white patches in mouth that can't be rubbed or scraped away, or ulcers that do not heal normally, which can be signs of other more serious mouth conditions such as trauma, infection, inflammation, malignancy, etc. The white patches can also result from pathogens such as viruses, fungi and bacteria that inflame the lining of the mouth causing redness, swelling, and ulcer development. Depending on the type of condition you have, white patches in mouth treatment may vary. Treatment for leukoplakia typically involves removing the source of irritation. If leukoplakia is caused by tobacco products, you will be asked to minimize or stop smoking altogether, or using other smokeless tobacco products. However, if leukoplakia is caused by an irregular tooth or the surface on a filling or a denture, the tooth can be smoothed and dental appliances adjusted or repaired. Leukoplakia is normally harmless, and lesions will usually clear up on their own or after the source of irritation is eliminated. If removing the source of irritation is ineffective in eliminating leukoplakia, the lesions might need to be surgically removed. The lesion can be removed either by an oral surgeon, or your dentist. 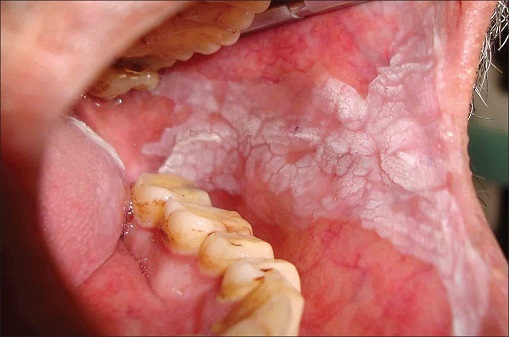 However, chronic hairy leukoplakia will require treatment with an antiviral medication. The goal for any treatment of oral thrush is to stop the rapid spread of the fungus, and the best approach depends on your age, your overall health, and the cause of the infection. However, thrush may be more difficult to manage in people with compromised immune systems. Antifungal medications are often prescribed to treat thrush, and these antifungal medicines are available in liquids, tablets, or lozenges. Your dentist will develop a specific treatment designed for you based on your age and the cause of the infection. Because the presence of a thrush infection can be a symptom of other medical issues, your dentist might recommend you to seek care from a medical doctor so that any underlying health problems can be treated. Pain from canker sores generally subsides in a few days, and the sores usually heal without treatment in one or two weeks. However, if sores are large, persistent and painful, your dentist might prescribe a corticosteroid ointment, an antimicrobial mouth rinse, a prescription or suggest an over-the-counter medication to reduce the irritation and pain. Using a soft-bristled toothbrush after meals and flossing daily. This may help keep your mouth free of foods that might trigger a sore. Why Do I Have Black Tongue? Is It Safe to Gargle Peroxide? How to Do It? Is Chewing Gum Bad for You? Crest Whitestrips Reviews: Do They Work? How Is Strep Throat Spread? Does Baking Soda Whiten Your Teeth? Why Do I Have Black Stains on Teeth? Salt Water Mouth Rinse: Is It Effective?